The film premiered at the same Toronto theatre where it was shot. Actors Doug Jones and Sally Hawkins are seen in the 2017 poster for Guillermo del Toro's "The Shape of Water." TORONTO — There were moments on "The Shape of Water" shoot when the team felt like they were in the windswept Sahara desert, as a gale blew through the set and sent dirt from nearby sand piles swirling into the air. Then there was the time cast member Michael Shannon accidentally crashed his character's car into a pole during filming. 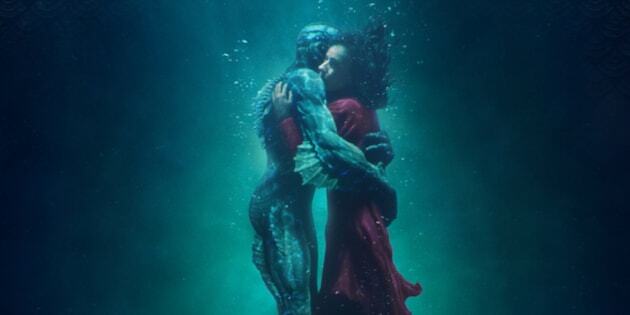 Such challenges arose in Hamilton and Toronto, where director Guillermo del Toro shot the dreamy merman drama that had a leading 13 Oscar nominations, including a best picture nod — and win — for himself and Toronto producer J. Miles Dale. Several other Canadians also had Oscar nominations for their work on the story of a mute janitor, played by Sally Hawkins, who falls for a captive and abused amphibian creature, played by Doug Jones. The film won four Oscars on Sunday night. Canadians Paul Austerberry, Jeffrey A. Melvin and Shane Vieau won for best production design on "The Shape of Water'' and thanked their colleagues back home. "Thanks to all the Canadian crew who are partying right now at the Palais Royale in Toronto — this is for you,'' said Austerberry, who is credited for production design while Melvin and Vieau crafted the film's set decoration. When the team found an area filled with giant sand piles on Hamilton's waterfront, it seemed the perfect spot for a scene in which a group of Russian spies meet up. But the weather posed a problem. "The day we were shooting it was a gale," said Toronto-based production designer Paul Austerberry, who got an Oscar nomination for his work on the film. A scene in "The Shape of Water" was filmed near the waterfront in Hamilton, Ont. "We had been there like five times and it's all fine, and then the day we show up to shoot, literally it was like being in the Sahara on a windy day where everyone had to wear goggles and all the sand was getting into the equipment," added Dale. But Austerberry said it added to the drama. "It was very difficult shooting but it made for a really interesting sequence, because we couldn't really pay for that." The opulent Toronto venue, which opened in 1913, was used for the interior shots of a movie theatre that Hawkins' character lives above. Dale said the theatre's red velvet chairs were the perfect colour to convey the film's theme of love. Actress Sally Hawkins performs with actor Doug Jones in Toronto's Elgin Theatre. The Elgin was also where the movie premiered at the Toronto International Film Festival. "It was this meta moment as you're watching the premiere of the movie and you're sitting in the theatre — and on the screen comes the theatre that you're sitting in," Dale said. Red is also the colour of the doors on the outside of this storied 123-year-old Toronto concert venue, which was used as the exterior of the film's movie theatre. The team erected a giant marquee onto the exterior and had a narrow window in which to shoot between concerts at the venue. They also had to work around the city's plans to repave the road right outside. "Originally they were like, 'You can't shoot there,' and we were like, 'We have to shoot there,'" Dale said. "The mayor helped to sort that out for us." Then there was a little issue of Shannon accidentally crashing his character's car during filming outside the venue. Actor Michael Shannon crashed a car outside Massey Hall in Toronto while filming "The Shape of Water." Dale said Shannon forgot to put the car into park when he pulled up in front of the venue for a scene. "We're in the tent watching video — in the path of where the car is coming, but we can't see it because the tent is up," Dale said. "We're watching it on video and the thought is going through your head as, 'Do we bail? What do we do here?'" The car ended up rolling into a decorative pole and then kept going into a telephone pole. Filming was stalled as cops and city crews tended to the scene. "Michael (had) tried to dive back into the car, get it into park, he's been dragged by the car, now he's totally upset and embarrassed and humiliated," Dale recalled. "So Take 1 is in the movie and there was no Take 3. Take 2 may or may not appear on the deleted scenes of the DVD." University of Toronto's Andrew Building at the school's Scarborough campus is seen in "The Shape of Water" trailer on the left, and on a normal day, on the right. The Andrews Building at the University of Toronto's Scarborough Campus had the perfect brutalist architecture to pose as a government research facility. Hamilton's City Hall posed as an advertising agency. Toronto's Lakeview Lunch diner was used as a pie shop. The final scene was shot at a dock at Toronto's Keating Channel waterway, with the Gardiner Expressway as the backdrop. The city's iconic CN Tower had to be digitally scrubbed from the background of some shots. Many interior scenes were shot on sets at Toronto's Cinespace Film Studios. This story has been updated with information about the film's Oscar wins.